Gray-less Hair Rinse helps to supply body with necessary nutrition for melanin production. Melanin production slows down as the human body ages, including melanin production in the roots of the hair, which can cause new hair to grow with a reduction or absence of pigment. Gray-Less Hair Rinse helps to supply the hair with necessary nutrition for melanin production. This rinse also contains rosmarinic acid, which naturally restores hair color keeps hair healthy looking. Direction: Let the “tea bag” steep for at least 15 minutes or until warm. Rinse your hair with the solution. You may use this rinse as often as you want. Leave in and style as usual. 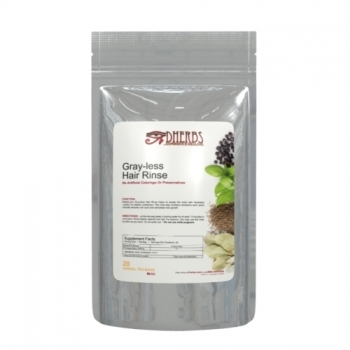 The Gray less Hair Rinse is in tea form but was designed to be used as a rinse for the hair. Because we use 100% natural herbs, you can still consume it as a tea safely. For best results we suggest using it as instructed. Can you drink the tea? No, you cannot consume the Gray less Hair Rinse it's not a tea.